I recently told you about a new restaurant in Baltimore County. It seems as if I’ve been dining at new restaurants a lot these days. These time around we go to Howard County and stop by Cured and 18th & 21st. Both are located in the Merriweather One building, very close to Merriweather Post Pavilion and just off Broken Land Parkway. They are locally owned by Steve & Patti Wecker and also Vince Culotta. Let me begin with Cured. This is the first restaurant you’ll see as you enter. There’s a 29 seat bar, charcuterie bar and two dining areas. I noticed a fully stocked bar and people enjoying their dinner. The dining rooms were filled and that’s a good sign, especially for a restaurant that just opened in June. It’s open for lunch and dinner and brunch on weekends. The brunch menu offers fennel cured salmon, short rib hash, eggs benedict, cream chipped beef, breakfast burger sliders, chicken & waffle, and plenty more. The lunch and dinner menu offers, among other selections, soups, salads, sides, lots of cheeses, fried chicken, pan roasted salmon, mushroom cavatelli, pulled pork, bacon wrapped meatloaf and a cured burger. To get to 18th & 21st, you walk down a hallway and open a door. When you do you’ll think you entered a time capsule and landed in another decade, like the 20s or 30s. The atmosphere will immediately draw you in. When the music begins you might expect to see F. Scott Fitzgerald. Music (duo or trio) is offered six nights a week with the tunes and groups supervised by their music director John. I can’t recall the last time I encountered a music director in a restaurant. He has other duties but keeps a close eye and ear out for what’s offered the patrons. The room is decorated in chic early century (the 20th) motif. The ceiling has a skyline (not photos, more like drawings) of Chicago. It’s all very well done and you get the feeling you’re no longer in Kansas, or in this case Columbia. I felt like I was seated in the Algonquin in New York. The owners know about attention to details. As far as further helpful information, there’s plenty of free parking in the adjacent lot, a Happy Hour, reservations, especially weekends, highly recommended, a small private room, very attentive service, carry out, specials and great menu items. 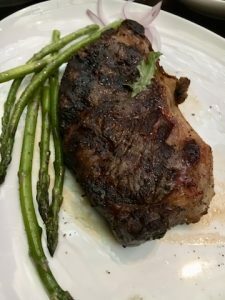 Some of those items include the N.Y. strip, roasted spring chicken, diver scallops, cinnamon & honey roasted rack of lamb, appetizers, cheeses, soup, salads and raw (oysters, crab salad, shrimp), cocktails and wine. By the way, 18th & 21st is not an address. It refers to the 18th and 21st amendments, one bringing prohibition in, the other repealing it. And I really like the way they answer the phone – after the mention of the name of the restaurants and their name they ask, “How can I make your day your more memorable?” Your day will be more memorable by giving either restaurant a try. Reach them at 667-786-7111 or go to cured1821.com.